Tweet Up! Meet tweeple IRL! There has been some discussion on twitter about working out a tweet up at NCECA this year. We’ll actually have a couple of opportunities for you to meet all your twitter friends IRL at the conference. Tuesday night at the Gallery Expo opening reception, I (Cindy) will have some special tweet-up token to drop into your NCECA name badge holder, and a silver sharpie pen for you to write in your twitter handle, so that throughout the conference we’ll be able to find each other. How will you find me to get the token you may wonder? 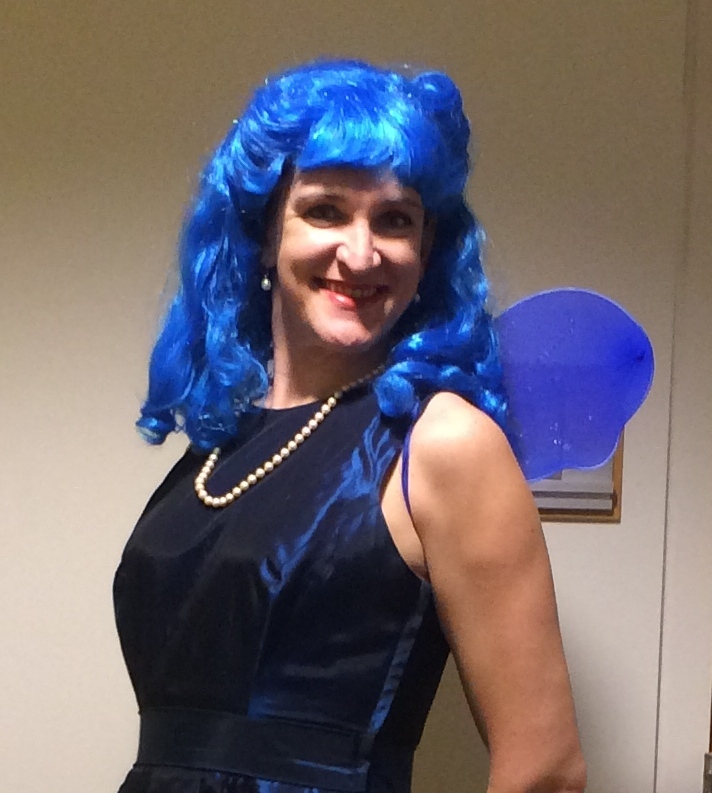 Well, I was recently in a production of Pinocchio as the Blue-Haired Fairy, and I thought about asking to borrow the twitter-blue wig I had to wear, but I didn’t know if it would travel too well. I hate to spoil an opportunity for you all to be amused by a blue-haired version of me, so here’s the pic anyway. It should help you know who to look for, even sans blue hair. And at 6′ tall, (possibly taller if I opt for heels that night) I’m pretty hard to miss….The NCECA booth should be accessible during the expo reception and throughout the duration of the conference, so if you don’t catch me, stop by there to get a fractal bluebird token as seen at the top of this post.